This is just going to be a short was supposed to be shorter. Whatever. The main component of the Call of Duty games has been the multi-player in all except the first couple iterations, and Black Ops does nothing to change this, although I will start by saying that it's a bit longer and more varied than the last couple of games' single-player components. This area in particular has been worked on a fair bit. The plots in Call of Duty 4 and MW2 weren't BAD exactly, but they definitely took a back seat, and could've been more fleshed out (especially in the case of MW2). Black Ops actually spends quite a bit of times on developing the game's story, and it's a better experience for it in a couple of ways; firstly, it's just more interesting, and secondly, more time spent with exposition meant better pacing. I'm not going to talk about the plot itself because honestly, I don't want to give anything away. It's a tad predictable, but it's still great to watch the story unfold. It's got a bit more of a personal psychological bend this time around and a stronger focus on the story of the player's character, as opposed to the story of events happening around them – although there's also a pretty good over-arching plot giving the character's personal journey context. I'd say this game features the best developed plot of any game in the series. The setting is fairly varied and well fleshed out. The action of the game takes place from 1945-1968, and takes place primarily in Russia and Vietnam, although other locations also make appearences. There's a whole lot of references to other media, particularly well-known films, and especially in the Vietnam portions of the game. It's cool in a way, but in another way, I feel like there were a couple of points where they “borrowed” a little too heavily, lifting and entire scene straight from Deer Hunter, for example. The game goes a little bit “interactive history lesson” at times, which I actually liked and is something that was in early Call of Duty games, but not in the more recent entries. The Cold War story presented by the game is quite interesting, especially given that it's set in it's appropriate historical context. The characters are a little more detailed than in previous games, with more backstory, especially if you care to find the game's hidden intel, which you can then view for more background on the characters and story. They're also generally very well acted, although personally I found Sam Worthington's (Avatar) performance to be very hit-or-miss. He's a decent enough actor, but his attempt at an American accent is even less consistent here than in Avatar, and it's really painful to listen to. Aside from that, the entire supporting cast does an outstanding job, and includes some other names you'll probably recognise. Check out this section in my multi-player review – it's more or less the same. Briefly, the presentation is competent but not outstanding, with the graphics engine starting to look a little dated. The single-player environments are quite detailed and well developed, with a few in particular being very good, although nothing so atmospheric as Medal of Honor's environments. Sound design, similarly, is polished and gets the job done without being particularly amazing. The basic gameplay is the same as what we've grown accustomed to – that is, regenerating health, large hordes (sometimes infinite) of enemies with bland AI, and a basic but very effective shooting mechanic. There's a lot more variation in general, with a few more vehicle sections, more pseudo-sneaking bits (I say pseudo because the player has no agency in these – obey instructions from an NPC or lose, as is the case in previous CoD games, but they still feel good to play) and some other interesting little variations on the standard gameplay, such as a section where you command a squad of soldiers from a Blackbird flying in low orbit. MW2 moved at near break-neck speed throughout the entire game, which is okay, and probably better than a game that's much too slow, but it's still not ideal. 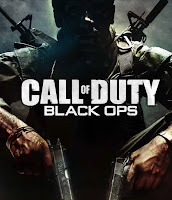 The pacing in Black Ops on the other hand is much more interesting, with distinctive ups and downs including stealth-based sections, many more cutscenes, and, of course, the balls-out action that the series is renowned for. Actually there are a few segments that feel a little too familiar, for example, a motorcycle escape scene that plays out eerily similarly to a certain snow-mobile chase sequence. Fans of IW's trademark and ridiculously over-the-top set pieces might be a little disappointed, as there's a bit less of that going on in this game, at least in my opinion, however this adds impact to the cinematic action in the game when it does get really intense. And there are a few moments that have a really high level of impact despite not featuring ridiculous, over-the-top action. All in all, the same gameplay as CoD4 and MW2 is at work here, albeit with better pacing and more variation. In many ways, the singe-player in Black Ops feels like a simple refinement of what came before. This applies to every aspect of the game, including story, and if you like the Call of Duty single-player experience, Black Ops is a very worthy entry. My final thoughts on the game in general? Treyarch have created an extremely polished product. It bleeds quality, despite my comments about the graphics and sound design being merely adequate. They're not amazing, but they still come off as very polished, very refined. It's unfortunate that this obvious love and attention wasn't given to a game that was more ambitious, or more original, because at the end of the day, for all its charm, Black Ops is marred by the fact that it's just another Call of Duty game, nothing more, nothing less. I'm already starting to get a bit tired of the multi-player, probably because it's the same thing again but with a new coat of paint, as I knew it would be. I'm really looking forward to the new year bringing in some new IP in the shooter genre, and there are some up-coming shooters that are much more ambitious than this game and looking very good indeed. The Call of Duty series has had a good run as the king of the FPS genre (Halo fans – I know, your game is huge too, but it's a simple fact that the franchise hasn't achieved the same level of raw financial success as Call of Duty) but it's really time to hang up the guns and make way for something new. It's the start of a new decade, and it's time for a change in the games we idolise.